Once, there was a Japanese TV show called GameCenter CX, in which a hapless comedian named Shinya Arino attempted to play through old video games, usually with terrible results. In 2007, developer Indieszero attempted to capture the show’s appeal in video game form, and amazingly secured a U.S. release for this most niche of titles. I’ve attended only one truly “life-changing” show—Negativland on the 2000 True/False Tour, at Stubb’s BBQ in Austin—though for 17 years I’ve struggled to articulate why, or to explain Negativland at all to the uninitiated. The easiest entry point is U2, both the band and the eponymous single that got Negativland sued for trademark infringement. The resultant notoriety helped the actual music—a Muzak-and-kazoos reworking of “I Still Haven’t Found What I’m Looking For,” underscoring an outtake of Casey Kasem ranting about “a little dog named Snuggles”—become a big hit in the Napster age, and thanks to rampant mislabeling, most people probably never even knew who did it. Or if they did, they probably assumed Negativland was just some Jerky Boys-esque prank group. So even to them, it’s difficult to explain the brilliance of albums like Escape From Noise, Dispepsi, Helter Stupid, etc. ; the vast mythology stemming from their weekly Over The Edge radio show; or their highly influential impact on “culture jamming” (a term coined by member Don Joyce)—at least without reducing the whole thing to dumb jokes, or sounding like a babbling hippie loon who’s read too many Church Of The Subgenius zines. And it’s even more difficult to explain why seeing the group bring its weird world to life that night so completely rewired my brain. (Though it’s possible the LSD helped.) All I know is that within a month, I was knee-deep in Situationist theory and staging my own multimedia shows with my own culture-jamming collective (scored by my own Negativland-rip-off sound collage project), all in repeated efforts to replicate that night. A year later, we were popping up in Adbusters, and I was doing a speaking tour in the U.K. alongside other culture jammers like the Reverend Billy, all because I caught this one concert. Again, none of this will make any sense to most people; even when I tried, many years later, to explain how that one show had briefly altered the course of my life to none other than Negativland co-founder Mark Hosler, he seemed skeptical. But it’s true—and look, I’m not alone! For a long time, this was just podcasts in general for me—and it still is, depending on the audience. Podcast fans and creators around the world know the frustration of explaining the phenomenon to people of, shall we say, Fox News age. Although awareness of podcasts has grown considerably the past few years, it’s still comparatively small, and when you drill down to the comedy podcasts I favor, explaining them gets more complicated. I’ve listened to Comedy Bang! Bang! since episode 33, and I’ve found myself stumbling as I’ve tried to turn other people onto it over the years: “So Scott Aukerman from Mr. Show hosts, and then he has a celebrity guest, but there’s also a comedian playing a character, either a recurring one or a new one—and wait, hold up, let me tell you about the origin of Heynong Man…” That sounds terrible, and Comedy Bang! Bang! is pretty straightforward compared to the more bizarre ones that have started in the years since. But it’s really good, I swear. There are dozens of video games that would fit the bill, from Metal Gear’s loony nuclear non-proliferation parable to the nonsensical Disney-meets-Final Fantasy melodrama of Kingdom Hearts, a plot so complex it famously took one enterprising fan 42 pages to create a comprehensible summary. My pick would have to be FromSoftware’s Dark Souls series, which is nigh-impossible to explain on many levels, whether it be the deliberately obtuse and statistic-driven swordplay or the vague, largely unspoken mythology, which has itself spawned a cottage industry of internet scholars to decipher it. It’s difficult to even answer the question of how all three games are related. Turns out, that’s a natural side effect of tossing out storytelling that adheres to the time-space continuum and instead building your fantasy universe around the futility of existence and an unstoppable cycle of death and rebirth. Todd Haynes is now the kind of prestige director whose films like Carol and Far From Heaven frequently crop up on year-end best-of lists. But I maintain a soft spot for one of his earliest projects, which is tough to explain: The 1988 short film “Superstar: The Karen Carpenter Story,” in which Haynes depicts the tragic life of the famous vocalist by acting it out with Barbie dolls. Naturally, that sounds campy and hilarious, and at points it is. But Haynes clearly has a deep affinity for his subject—one of the most emotive singers of all time—so Superstar turns out to offer a surprisingly moving portrayal of Karen’s career and the anorexia nervosa that ended her life at 32. He even shaves down the Karen doll so that as the film goes on, she becomes more and more emaciated. Karen’s brother, Richard, and mother are unapologetically painted as the villains in the piece, which caused the film to have some distribution problems, especially since it features so many classic Carpenters songs. But somehow, Superstar is now available on YouTube, where it depicts not only the life of Karen, but on a wider note, the tragedy of how women suffer by feeling that they must fit into a societal ideal. By the end, you’ll forget that you’re watching Barbie dolls at all. One of the reasons I love Stephen King’s Dark Tower books is precisely because they’re so hard to explain. The series is a sci-fi epic about a cowboy, which is weird on its own, but it also involves magic, zombies, killer robots that are clearly meant to look like Doombots from Marvel comics, and a big villain who is named after prog-rock band King Crimson. Also, a ton of Stephen King books and short stories directly tie in with The Dark Tower in some way, like The Stand, It, and ’Salem’s Lot, but even the ones that don’t could still be interpreted as a loosely connected alternate reality. Oh, and Stephen King himself pops up as a very important character in the books, and the time he almost died after getting hit by a van is a major plot point. It would be a lie to say that it all actually works, but as a patchwork universe that is constantly falling apart, I can’t help but appreciate the stupid boldness of it. My first job in high school was a demonstrator at a magic shop in Seattle. In college, I was paid good money to perform card tricks for drunk fraternity members. When I’m sitting in front of the TV at home, I’m usually fiddling with a deck of playing cards in my hands, like a tic. Magic has been in my DNA for as long as I can remember, and it’s difficult to explain to laypeople my motivation of performing it. Perhaps the biggest misconception is that magic is an art form in which the goal is fooling the spectator. 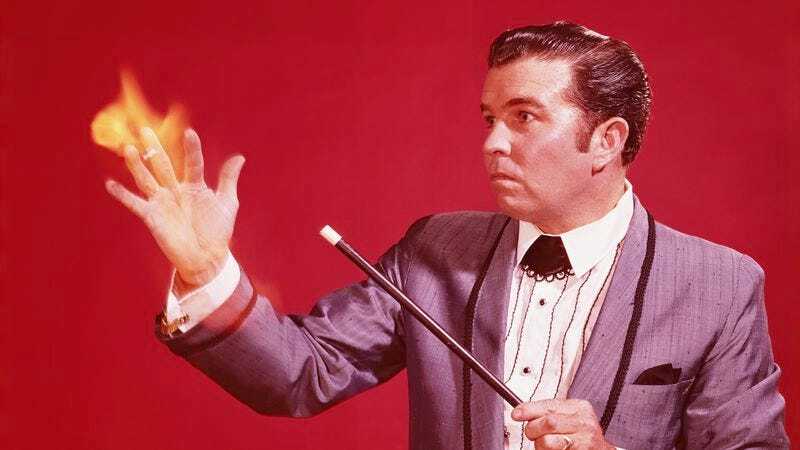 It explains why many have a negative reaction to magicians, because they view the relationship as inherently antagonistic—magician stumps spectator, magician wins. Apologies in advance if this sounds frilly and pretentious, but good magic—be it a coin disappears at the fingertips, or a playing card is hopelessly lost and miraculously rediscovered—should be a shared experience of wonder. Magic is never supposed to be “I just made you to be a fool,” and performers who approach magic like that are assholes. Good magicians create what the magician Paul Harris calls “the moment of astonishment,” the pleasurable click of cognitive dissonance where the logical mind can’t reconcile what was just witnessed. It’s a satisfying feeling, not one that should make you feel like a dunce. “It’s this experimental film from the ’60s, which doesn’t really have a plot but which follows two young women, both named Marie, who alternate between sitting around and saying oddball stuff, and generally raising a ruckus.” That is, more or less, my elevator pitch for Věra Chytilová’s Daisies, which, despite (or because of) its occasional impenetrability, is widely regarded as one of the foremost films of the Czech New Wave. In one scene, Marie I and Marie II march while sing-chanting, “We exist, we exist”; in another, they cut up a series of phallic foods with scissors. They prance in a field, get thrown out of a nightclub for goofing off, and get hapless men to take them out for meals, eating endless amounts of food and flopping their bodies about like looser-limbed Marx Brothers. There are overarching metaphors about subversion of the patriarchy and general anarchy (it was, ostensibly, banned for wasting food), yet even outside its political context, the film is worth watching. The colors are vibrant, it’s chockful of non sequitur imagery, and more than anything, it’s just fun to watch a couple of merry pranksters getting into trouble. I feel pen-and-paper roleplaying games require many extra layers of patience on the listener’s part to adequately explain. They’re time-consuming and unabashed deep dives into the most concentrated corners of sci-fi and fantasy in a way that can’t help but come across as a little absurd. Shadowrun, for instance, is a cyberpunk dystopia where giant international megacorps violently war amongst each other for the smallest sliver of market share. Which is straightforward enough. But wait! Magic has returned to the Earth, and now you can be a troll wizard on the payroll of a German corporation whose majority shareholder is a dragon. What becomes difficult to explain, despite being a veritable potpourri of ill-matching genres, is how natural the game feels while playing. The rules are fussy and require patience to learn, but from a storytelling aspect, you could be playing—for instance—a drug-addicted, Czech, party-boy night elf who follows a magical cat spirit named after a 1998 Serbian farce that grants you magical electricity powers, and it feels surprisingly casual. And also great fun. Even 15 years later, I’ll still occasionally find myself pressing the DVD of Don Hertzfeldt’s Rejected into someone’s hands and saying, ‘Look, it’s only, like, 10 minutes, just watch it, you’ll thank me later.” Hertzfeldt’s notoriety has grown in recent years, thanks to a 2016 Oscar nomination for Best Animated Short Film (his second, after Rejected) and his incredible couch-gag sequence for The Simpsons, but he’s been doing amazing work since the beginning, as evidenced by this now-cult classic. It’s a series of animated advertisements and commercial interstitials commissioned from a fictionalized Hertzfeldt by the Johnson & Mills Corporation and the Family Learning Channel. However, each set of animations is rejected upon completion by his sponsors, and soon, the world of these animated segments starts to fall apart. It’s one of those things that can be roughly explained, but only truly understood by actually experiencing it—much like The Matrix. Look, it’s only, like, 10 minutes, just watch it, you’ll thank me later.